Going against the grain often takes time, energy and effort. Unfortunately, sometimes doing so for the sake of being different isn’t really that wise – after all, why fix it if it ain’t broke? Well, the answer(s) to this question might just surprise you, but we’ll leave the philosophical thinking to the comments section while we help you see the whole point of the Chickenborg Egg Cuber. As we know, most eggs come in an overall oval shape, and if you decide to have hard boiled eggs, peeling open the shell would reveal a similar shape underneath. With the Chickenborg Egg Cuber, as its name suggests, you are able to make breakfast time slightly more different (and perhaps even fun for your kids), as your eggs will come in a cube shape. One of the advantages of this shape is, it won’t be able to roll off plates or trays so easily even when tilted at a sharp angle. 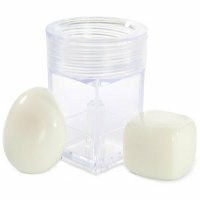 This acrylic Chickenborg Egg Cuber will retail for $5.99 and would make for an interesting addition to any kitchen this Christmas.